An apartment building in Cote-Saint-Paul. I'm sorta debating if this is ugly or just old. I actually like the retro design of it, including the beaver on top. It might look better if it was spruced up. It's sorta sad looking now. The wide front lawn dooms this building. Un immeuble d'appartements à Côte-Saint-Paul. Je me demande : est ce que c'est laid ou juste vieux? 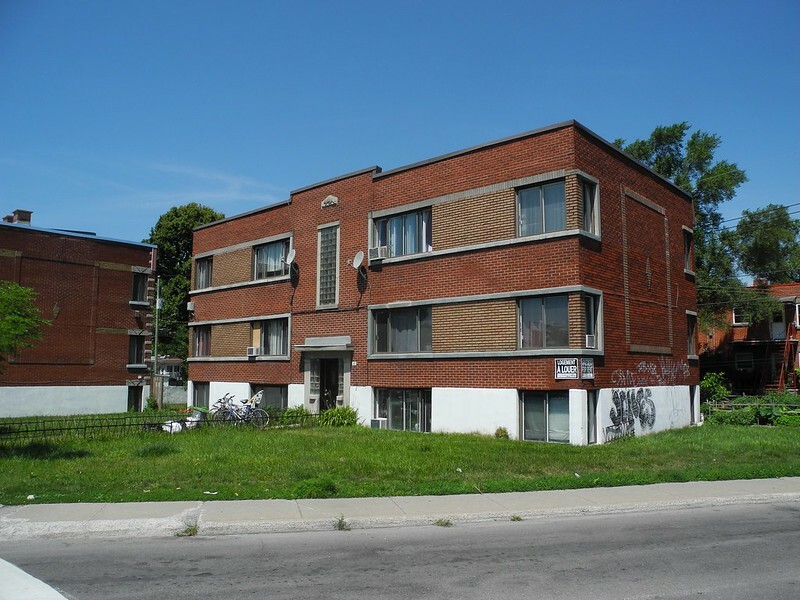 En fait, j'aime réellement la conception style rétro de ce genre de bloq d'appartements, y compris le castor au dessus. Le bloq a du potentiel mais en se moment c'a l'air plutot triste. Malheuresement, le terrain énorme de la cour d'en avant condamme cet immeuble. I like these old buildings a lot. What they lack in expensive or architect-ego-wanking architectural details, they make up in honest attempts to give the buildings some interesting things to see through simple bricklaying techniques (and the occasional beaver). The windows are large to let a lot of light in (and are probably lousy at keeping the cold out), the scale of the building is in proportion and I bet the room sizes are decent and the flooring is still good. Its just a shame that buildings like these don't get renovated often enough. I guess people who could afford the renovated apartment rents would rather have something trendier? Me? I would much rather grab an apartment in a renovated or very well-maintained building like this than some contemporary bland condo building. But I guess these are just the kind of buildings that wouldn't get heritage status or are shooting to become outright slums that developers and city planners will joyfully scour from the cityscape.